Session are useful when you want to store user data globally through out the application. This can be done in two ways. One is storing them in a global variables and second is storing the data in shared preferences. The problem with storing data in global variable is data will be lost once user closes the application, but storing the data in shared preferences will be persistent even though user closes the application. Application shared preferences allows you to save and retrieve key, value pair data. Before getting into tutorial, I am giving basic information needed to work with shared preferences. Application shared preferences can be fetched using getSharedPreferences() method.You also need an editor to edit and save the changes in shared preferences. The following code can be used to get application shared preferences. You can save data into shared preferences using editor. All the primitive data types like booleans, floats, ints, longs, and strings are supported. Call editor.commit() in order to save changes to shared preferences. Data can be retrived from saved preferences by calling getString() (For string) method. Remember this method should be called on Shared Preferences not on Editor. The following is a simple tutorial which will have a login form and a dashboard screen. At first user will login using login details and once he successfully logged in his credentials (name, email) will be stored in shared preferences. 2. I am adding alert dialog manager class to show alert messages while validating the login form. Create a new class and name it as AlertDialogManager.java and paste the following code. 4. In this example i am storing login status, name, email in shared preferences, so i added a function called createLoginSession(String name, String email) to SessionManagement class. Add the following function to SessionManagement.java. > This function simply stores login status(true), name, email in shared preferences. 5.In order to get the stored preferences data, I added a function called getUserDetails() with the following code. 6. To check whether user logged in or not i added a function checkLogin() which you can call in all Activities to check user login status. 7. Add a function called logoutUser() to clear all the data from shared preferences. Call this function when you want to logout the user. 8. Until now we are done creating Session Management class and now we are going to learn how to use this class in your application. For this create a simple login form asking username, password. For testing purpose i am checking username, password as test, test. Once the user enters correct login details a session will be created by calling session.createLoginSession(“Android Hive”, “anroidhive@gmail.com”) and user is redirected to MainActivity. 9. After user redirected to MainActivity, I am getting stored session data by calling getUserDetails() and displayed in textviews. > If user is logged in, user details are fetched by calling session.getUserDetails() and displayed in textviews. > Also I have logout button which invokes a function session.logoutUser() to clear the session data. 10. Open AndroidManifest.xml file, add the following code and run the project. What a remarkable tutorial,thank you very much. 3 data ip,username,password from loginActivity.java but when am getting those data 3 values in MainActivity.java it returning ip address value only..
i think it is nice post of beginners.. Your all tutorials are the best examples of excellency and brilliancy in android. Hey I am new to android. I find all these tutorials and applicaiions so great. Error. What should I do? Is this code available if i use a Sqlite database? So, what you recommend to managment the session???? Thanks!!! thanks a lot. . . .
Hey I am new to android. I find all these tutorials and applications so great. Nice Job. The class is very nicely written and very useful. This helped me out more than you know. This may have been simple, but was perfect for what I needed in order to come up with my own solitions. Thanks. when I make calls to the server, how can I know that the calls came from a particular user and not anyone else? hey your tutorials are very helpfull, am working on a small system and need help with the sqlite db.. Thanks so much for your all useful tutorials. I found a problem when pressing “back” button at login screen. It will bring me to main screen without logging in. what modification should be done for that? If we again start the app logout page still opens with null entries! still same result.. pls help! why there is isLoggedIn() method on checkLogin() method even though you don’t declare any isLoggedIn()? you must see ‘editor.putBoolean(IS_LOGIN, true);’ to assign, and pref.getBoolean(IS_LOGIN,false). to get the value. Good tutorial. Shouldn’t SessionManager be singleton? We are crating a “new SessionManager” object in every activity of the app. Is that necessary. good and how make registration? Thanks for this helpful tutorial, but when pressing “back” button after logging in, it is not clearing the text of username and password entered by the user, how to do that? You probably figured it out already, but here goes. You can clear the 2 EditTexts in the OnClickListener of the Login button. Thanks por this tutorial, but i have a question: When I press back button, my application returns to previous activity, you help me, please. Hi Ravi, will u please tell me how to maintain session time in application. this works fine for me, just need to change the IP address.. and this is EXACTLY what im looking for, thanks for the tutorial!!!!!! Hi! Thanks for sharing. I am new to android, I have a question. How to display value such as username, age from MySQL on activity_main.xml after login ? Is it possible to create a button for the user to be able to post data to a listview and be able to delete it??? If so can you please give me a little details or a tutorial reference ? Found wrong code on Session class, there is addFlags(Intent.FLAG_ACTIVITY_CLEAR_TOP) for kill all activities, it must be Intent.FLAG_ACTIVITY_CLEAR_TASK. Very helpfull tutorial. Thank you. All your tutorials are helpful. Thank you very much. It was very useful. Thanks for sharing. Can u let me know how to connect the same with mysql database? Why a hashmap instead of a User object? You can’t store the object directly. May be you can use gson to convert the object to json and store, convert the json back to object while retrieving. i.addFlags(Intent.FLAG_ACTIVITY_NEW_TASK); and it worked fine! Good tutorial. Shouldn’t SessionManager be singleton? We are crating a “new SessionManager” object in every activity of the app. Is that necessary ? No answer…. you used sigleton Slim tt?? hello sir, I am new in android even in development plzzz tell me I want to change test as username and password and want to login through user defined username and password. did you create isLoggedIn() method in SessionManager.java? Did u got the solution..? it is same code as you provide of shared Preference. Have you imported the textview in activity using findViewById() for username? Nevermind, I had set the content view of some other activity, hence could not find the view. After logout just try pushing the back btn from navigation bar! Whenever i launch the app from apps menu its shows the login screen only, even login status is true(i checked the login status by using “Toast”) Toast shows login status as true. Is there any solution to hide the login activity after logged in??? Yes, Code as per you given. Did u get the solutions ?? sir, can we apply typeface attribute (telugu fonts) for the strings in the android code. Hey ! This tutorial is so helpful ! how to work with the token and sessions ?? do you have any tutorial for that too ? why is it not creating session? If I want to redirect the logged user, will be this archieve on this line right? Is it possible to avoid the deleteUsers function in the logout and having the right fetching user details ? (because I don’t want to drop my table due to the foreign key with another table) Thanks a lot for this tutorial !! session.isLoggedIn() showing “true” in my code even after clearing background running…..but leading to login activity every time…..
How can I verify stored Email id as username and Password in the Database? I want to Login this way. Please help. thanks.. great tutorial. 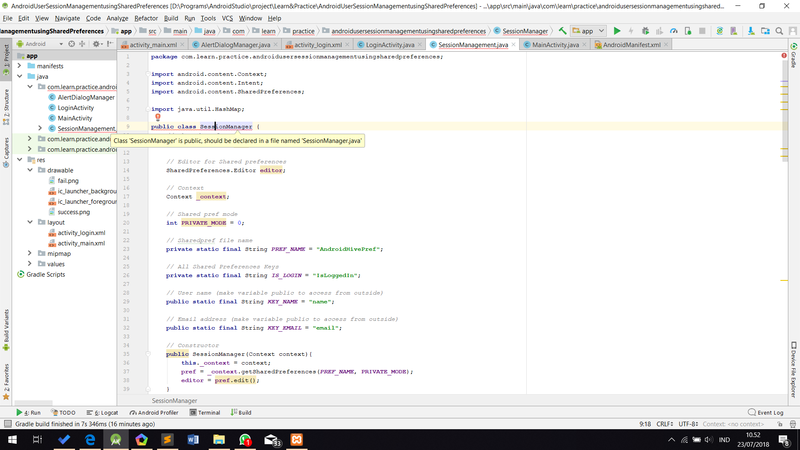 i’m using android studio. it require me to create a session manager class what i do??? great post. can i ask? why i can’t put session = new SessionManager(getApplicationContext()); in my database adapter? can you help? Now, you can then pass ContextGetter.getAppContext() in the session Manager constructor and it will work without errors. Hope this helps. Your file name is SessionManagement.java. But class name is SessionManager. Fix that for new learners. Android Session concept we will use only Shared preference .Why ? Any other Choice ? I’m a total newbie to Android. Thanks for this awesome tutorial! Thanks for this awesome tutorial…!!! I really want to comment you for a job well done. but i seem to be having issues with this>>>>>>>>>>>Toast.makeText(getApplicationContext(), “User Login Status: ” + session.isLoggedIn(), Toast.LENGTH_LONG).show();……..especially this>>>>session.isLoggedIn(), its showing red depicting there’s an error. pls help. How do these work if KEY_NAME & KEY_EMAIL are private in SessionManager? You can not access a private variable outside its class according to java concepts. you have to make them public. Thanks man! your tutorial really helped. In the Intent Filter LoginActivity should in place of MainActivity, bcz first of the all LoginActivity is running. Super tutorial i have implemented one in my app thank you ssooo much..
sir please tell me who i verify email via otp give me code. Hi Ravi, great tutorial as always. I have a question please, what is the best way to set a timeout to the session after not interacting for certain time? I dont know it is the true contact way to take some advices but I need some help about my project. In my project, I need to guarantee that if someone open a session with his/her email adress and password, I must ensure that he/she is a real person and he/she cannot open another session through another phone. You can think as a mobile banking application. Likewise, another person cannot access from another persons account. sessions must be unique for each user. Is this possible? Then you need to maintain unique session on your server side. When a request is made from mobile to server, send the session id (received in a cookie) and validate on server. If multiple sessions are present, invalidate all leaving one. After applying the code for backpress ,If we again start the app logout page still opens with null entries. hey i made a session in sharedpreference for get user id from database but it does not get id. what should we do if we want that our log in activity just appear once …means if we open our app 2nd time log in activity should not appear,instead main activity should appear. these if controls wheter you logedIn or not, (if you loged in then go to mainActivity). My issue is, with the given code, the checkLogin() method runs , but it does not start the LoginActivity for me having IS_LOGIN = false. & executes the following codes below that, which should not happen. I think if the checkLogin() method runs successfully , then it should start the LoginActivity and terminate all other activities & the codes written below the call to ckeckLogin method should not be executed. Also navigates to the previous activity on pressing back button. Please help. Hi. Have you figured a solution for this issue ? Hello Ravi, Nice and Clean step-by-step tutorial there! But i found some mistyped important word in your tutorial, that may lead a beginner into a confuseness and may i give the correction? On the step 3, you said that we have to name the file by SessionManagement.java. But the public class itself named SessionManager, which is not match with the name of the class. I thought it was fine at first, because the app ran fine, but suddenly it made the app crash. I use auto fix by Alt+Enter to see what option i have to resolve it, then yeah that’s the problem. Thanks Muhammad. I’ll correct it. Hai Bro, How to do this for radio buttons and checkboxes? I am new in android i try to implement it in my learning project but getting on error. Guys change MainActivity to LoginActivity & LoginActivity to MainActivity in Android Manifest File. , is this possible , how?? can i add three arguments in HashMap like that..? ?